The tutorial explains how to do sum in Excel by using the AutoSum feature, and how to make your own SUM formula to total a column, row or selected range. You will also learn how to sum only visible cells, calculate running total, sum across sheets, and find out why your Excel Sum formula is not working. For something more permanent, use the Excel SUM function. It is very simple and straightforward, so even if you are a beginner in Excel, you will hardly have any difficulty in understanding the following examples. However, if you need to sum a few dozen or a few hundred rows, referencing each cell in a formula does not sound like a good idea. In this case, you can use the Excel SUM function specially designed to add a specified set of numbers. The first argument is required, other numbers are optional, and you can supply up to 255 numbers in a single formula. In real-life worksheets, the Excel SUM function is often included in bigger formulas as part of more complex calculations. And here's another example of using an advanced SUM formula in Excel: VLOOKUP and SUM formula to total all matching values. If you need to sum one range of numbers, whether a column, row or several adjacent columns or rows, you can let Microsoft Excel write an appropriate SUM formula for you. As you can see in the following screenshot, Excel's AutoSum feature not only enters a Sum formula, but also selects the most likely range of cells that you'd want to total. Nine times out of ten, Excel gets the range right. If not, you can manually correct the range by simply dragging the cursor through the cells to sum, and then hit the Enter key. Tip. 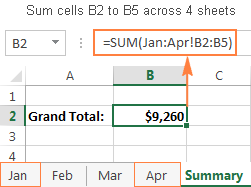 A faster way to do AutoSum in Excel is to use the Sum shortcut Alt + =. Just hold the Alt key, press the Equal Sign key, and then hit Enter to complete an automatically inserted Sum formula. Apart from calculating total, you can use AutoSum to automatically enter AVERAGE, COUNT, MAX, or MIN functions. For more information, please check out the Excel AutoSum tutorial. To sum numbers in a specific column, you can use either the Excel SUM function or AutoSum feature. Important note! In no case you should put your 'Sum of a column' formula in the column you want to total because this would create a circular cell reference (i.e. an endless recursive summation), and your Sum formula would return 0. Usually, supplying a column reference to the Excel Sum formula totals the entire column ignoring the header, as demonstrated in the above screenshot. But in some cases, the header of the column you want to total can actually have a number in it. Or, you may want to exclude the first few rows with numbers that are not relevant to the data you want to sum. Regrettably, Microsoft Excel does not accept a mixed SUM formula with an explicit lower bound but without an upper bound like =SUM(B2:B), which works fine in Google Sheets. To exclude the first few rows from summation, you can use one of the following workarounds. Remembering the worksheet size limits, you can specify the upper bound of your Excel SUM formula based on the maximum number of rows in your Excel version. 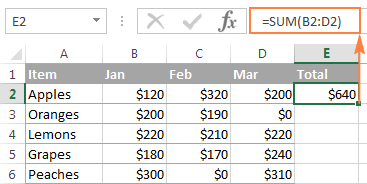 Similarly to totaling a column, you can sum a row in Excel by using the SUM function, or have AutoSum to insert the formula for you. =SUM(B2:D6) - sums values in rows 2 to 6. =SUM(B2:D3, B5:D6) - sums values in rows 2, 3, 5 and 6. If your data is organized in an Excel table, you can benefit from the special Total Row feature that can quickly sum the data in your table and display totals in the last row. 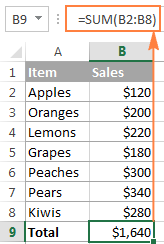 A big advantage of using Excel tables is that they auto-expand to include new rows, so any new data you input in a table will be included in your formulas automatically. If can learn about other benefits of Excel tables in this article: 10 most useful features of Excel tables. To convert an ordinary range of cells into a table, select it and press Ctrl + T shortcut (or click Table on the Insert tab). Click anywhere in the table to display the Table Tools with the Design tab. Another way to add a total row in Excel is to right click any cell within the table, and then click Table > Totals Row. When the total row appears at the end of the table, Excel does its best to determine how you would like to calculate data in the table. If you want to perform some other calculation, select the corresponding function from the drop-down list such as Average, Count, Max, Min, etc. If the total row automatically displays a total for a column that doesn't need one, open the dropdown list for that column and select None. Note. When using the Excel Total Row feature to sum a column, Excel totals values only in visible rows by inserting the SUBTOTAL function with the first argument set to 109. You will find the detailed explanation of this function in the next section. Sometimes, for more effective date analysis, you may need to filter or hide some data in your worksheet. 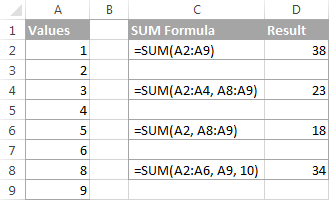 A usual Sum formula won't work in this case because the Excel SUM function adds all values in the specified range including the hidden (filtered out) rows. If you want to sum only visible cells in a filtered list, the fastest way is to organize your data in an Excel table, and then turn on the Excel Total Row feature. As demonstrated in the previous example, selecting Sum in a table's total row inserts the SUBTOTAL function that ignores hidden cells. Another way to sum filtered cells in Excel is to apply an AutoFilter to your data manually by clicking the Filter button on the Data tab. And then, write a Subtotal formula yourself. Function_num- a number from 1 to 11 or from 101 to 111 that specifies which function to use for the subtotal. You can find the full list of functions on support.office.com. For now, we are interested only in the SUM function, which is defined by numbers 9 and 109. Both numbers exclude filtered-out rows. The difference is that 9 includes cells hidden manually (i.e. right-click > Hide), while 109 excludes them. So, if you are looking to sum only visible cells, regardless of how exactly irrelevant rows were hidden, then use 109 in the first argument of your Subtotal formula. Ref1, Ref2, … - cells or ranges that you want to subtotal. The first Ref argument is required, others (up to 254) are optional. Tip. 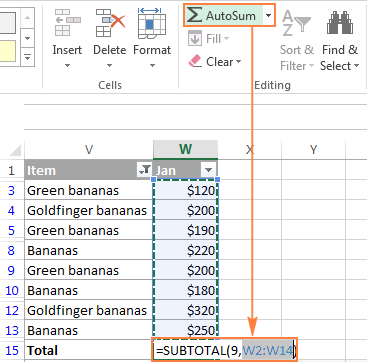 You can have Excel's AutoSum feature to insert the Subtotal formula for you automatically. Just organize your data in table (Ctrl + T) or filter the data the way you want by clicking the Filter button. After that, select the cell immediately below the column you want to total, and click the AutoSum button on the ribbon. A SUBTOTAL formula will be inserted, summing only the visible cells in the column. To calculate a running total in Excel, you write a usual SUM formula with a clever use of absolute and relative cells references. 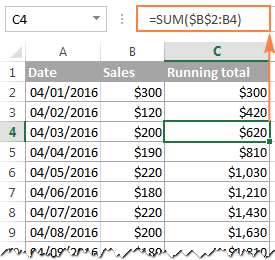 You can find the detailed explanation of this basic Cumulative Sum formula and tips on how to improve it in this tutorial: How to calculate running total in Excel. 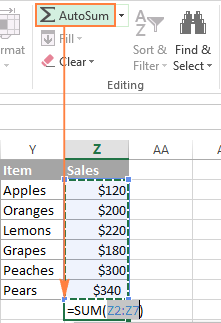 If you have several worksheets with the same layout and the same data type, you can add the values in the same cell or in the same range of cells in different sheets with a single SUM formula. You can find more information about a 3-d reference and the detailed steps to create such formulas in this tutorial: How to create a 3-D reference to calculate multiple sheets. If your task requires adding only those cells that meet a certain condition or a few conditions, you can use the SUMIF or SUMIFS function, respectively. Note. The Conditional Sum functions are available in Excel versions beginning with Excel 2003 (more precisely, SUMIF was introduced in Excel 2003, while SUMIFS only in Excel 2007). 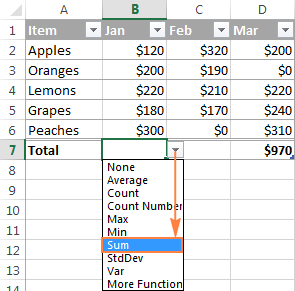 If someone still uses an earlier Excel version, you'd need to make an array SUM formula as demonstrated in Using Excel SUM in array formulas to conditionally sum cells. Are you trying to add a few values or total a column in your Excel sheet, but a simple SUM formula doesn't compute? Well, if the Excel SUM function is not working, it's most likely because of the following reasons. It's the easiest error to fix. In 99 out of 100 cases, the #Name error indicates that the SUM function is misspelled. 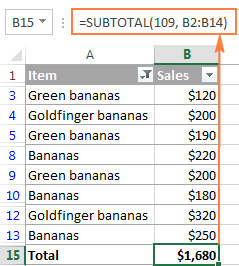 Another common reason for a Sum formula (or Excel AutoSum) not working are numbers formatted as text values. At first sight, they look like normal numbers, but Microsoft Excel perceives them as text strings and leaves them out of calculations. To fix this, select all problematic cells, click the warning sign, and then click Convert to Number. If against all expectations that does not work, try other solutions described in: How to fix numbers formatted as text. 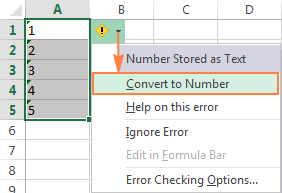 Apart from numbers formatted as text, a circular reference is a common source of problem in Sum formulas, especially when you are trying to total a column in Excel. So, if your numbers are formatted as numbers, but your Excel Sum formula still returns zero, trace and fix the circular references in your sheet (Formula tab > Error Checking > Circular Reference). For the detailed instructions, please see How to find a circular reference in Excel. If against all expectations your Sum formula returns a bigger number than it should, remember that the SUM function in Excel adds both visible and invisible (hidden) cells. 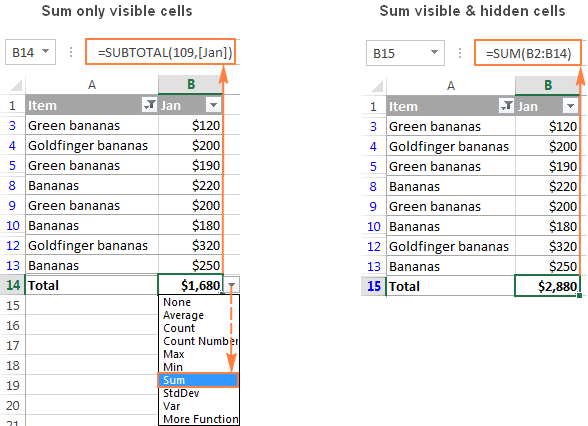 In this case, use the Subtotal function instead, as demonstrated in How to sum only visible cells in Excel. When a SUM formula in Excel continues to show the old total even after you've updated the values in the dependent cells, most likely Calculation Mode is set to Manual. To fix this, go to the Formulas tab, click the dropdown arrow next to Calculate Options, and click Automatic. Well, these are the most common reasons for SUM not working in Excel. If none of the above is your case, check out other possible reasons and solutions: Excel formulas not working, not updating, not calculating. This is how you use a SUM function in Excel. If you want to have a closer look at the formula examples discussed in this tutorial, you are welcome to download a sample Excel SUM workbook. I thank you for reading and hope to see you on our blog next week. 40 Responses to "Excel Sum formula examples - how to total a column, rows or only visible cells"
thanks for the tip on How to sum only filtered!!! I have a data table that is updated daily, for example, a new column is added daily, I want to find the difference between the last updated column & first column. But, don’t want to rewrite formula each time. I'm a new user I have a units and and unit cost say I have 50 units and each are 1.99 how do I get home he sum.I would really appreciate it. What is the formula to sum up a total billing per Customer# by Customer name. I also need a formula of average billing and the highest billing per Customer. I need the SUMIF formula if applicable. Thank you for your help. lots of good stuff herein - thanks! 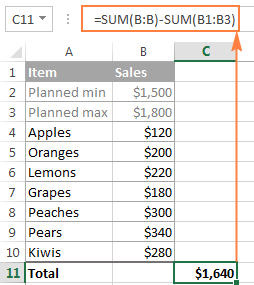 But, I want to make bold the "sum" product of auto-summing in the bottom bar of the Excel screen (where "sum" is accompanied by "average" and "count"). I'm 85 and even with glasses the sum product is not very visible. Microsoft should change this and make it bold. All octogenarians would give a shout-out if they did. I want to know i have excel sheet i want to fix the SUM formula after filter the sheet in some selected row actually i have tried after filter but which cell is hide that cell Qty also adding in total please check tell me if you have any formula. I want to run an inventory sheet where I can take from a beginning number or add to that same number and have it give me a quantity on hand. Example. I have 20 of something and tomorrow I remove 4 of them so I need a box to calculate that I now have 16 but the next day I add 10 back into the qty- I now want that box to show I have 26. I have a budget worksheet by month. Totaled income/expense at the end of each month. 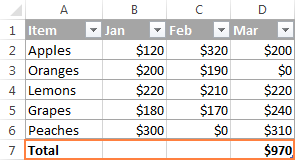 Jan=column B etc....but when adding income/expense to Feb (column C) is adds or remove from my January total. My formula for January is =SUM(B62-B49)so why is adding to column C effecting this? Now i want like every scope highest amend no details. the total of this will be "6342." but it automatically skip pop & ram & give answer "7721." how to calculate the sum of the following? I did: sum age of child meeting (0-1) in B1 which is always showing 0 gram weight increase, for those child who doesnot exist (mistake calculation), want to display empty cell for such case and sum only of there is value in column J. Formulas working fine for the existing child. I couldnot localize how to calculate for those rows that donot exist in A and display empty cells in B. Again, for reminder: excel is showing 0 gram increase for those child that doesnot exist in my excel sheet. I tried 100s of formulas but non of them worked. I did: sum age of child meeting (0-1) in B1 which is always showing 0 gram weight increase, for those child who doesnot exist (mistake calculation), want to display empty cell for such case and sum only of there is value in column B. Formulas working fine for the existing child. I am trying to sum columns and if the total is 40or more, change the total to 40 which is the set up maximum. And if the total is less than 40, then just show the correct total. Can somebody help me with the formula? Thank you. If I enter amounts with decimals or cents I am not able to view the whole total (the amounts to the right of the decimal point). 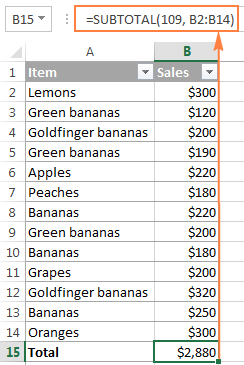 How do I extend the area to view the entire total? How to find the sum of formula cells only ? I would like get sum result only with the kgs, above result should be 10 kgs. Could you pls advise how to solve it. ROW...... 6 3 5 9 2 4 = SUM ? Too much thanks, It's very useful. Thanks. It helped me a lot.